Four Catholic priests - an hour long show - what could go possibly wrong? Come find out! Vatican You is a weekly walk through the teachings of the Church right smack dab in the middle of every day life. Come join the fun! Vol. 2, Ep. 4 "Justice and Mercy"
The gang's all here for this weekend's upcoming Vatican You! All four co-hosts are back together for this edition of Vatican You, rounding our the last paragraphs of Pope Francis' writings setting this Holy Year of Mercy in motion. In this episode, building on Fr. Chris' 2-Minute Drill, we explore the relationship between justice and mercy, and how that is cause for great joy. Catch up with Fr. Shaun back from his newsworthy and globetrotting adventures. Find out why its important to go right to the source with Pope Francis, and not rely on the quick headline. Explore how justice and mercy are really in harmony when we understand them correctly, and how the "rules" that God gives us are born from both justice and mercy. Discover what all this has to do with "indulgences" - and see how truly indulgent the Father is with His mercy. A patron saint...for plumbers? You bet! Find out on this week's Patron Saint Roulette. All this - plus how to apply this in everyday life, on this week's Vatican You! Vol. 2, Ep. 3 "Making Room for Mercy"
We discuss Pope Francis' wisdom in not giving us a sound-byte definition of mercy - and how what he does give us is the perfect invitation to encountering mercy in a new way (with a BIG shout out to Fr. Harry Hagan, OSB from St. Meinrad). Fr. Chris and Fr. Jerry tout the 'perfect solution' for Fr. Shaun when he's stranded in a snowstorm for more than 24 hours on the Pennsylvania Turnpike - "pocket coffee". Fr. Jerry gets this week's last, last word. Listen right from this page! And be sure to subscribe to Vatican You's podcast on iTunes. Vol 2, Ep 3 "Making Room for Mercy"
The virtues of "pocket coffee", why its helpful that Pope Francis doesn't give us the soundbyte definition of mercy in his writing on the Extraordinary Jubilee Year of Mercy, and the relationship between pilgrimage, holy doors, and the importance for us all to make room for conversion are all part of our walk through par. 11-19 of Misericordiae Vultus this week. See what all that has to do with "making room for mercy," along with Fr. Alan's 2 Minute Drill, Fr. Chris spinning the Patron Saint Roulette wheel, and Fr. Jerry's last, last word. Enjoy! Vol. 2, Ep. 2 "The Never Ending Story"
This week we get into the meat of Pope Francis' teachings in Misericordiae Vultus - that is, of course, after Fr. Alan fires his laser to get that worked out of his system. Fr. Chris takes this week's 2-Minute Drill pointing out that if there's anything never-ending about the human story, it is God's infinite and patient mercy. Hear Fr. Shaun's famous 'creative Latin' and let it give you a fun chuckle. Discover how God's mercy (and patience) is rooted in His divine nature. Fr. Jerry takes this weeks "Pop Quiz Hotshot" question - "What is an indulgence?" 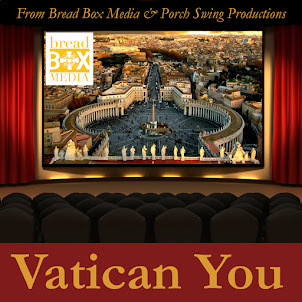 Hear the absolutely certainly not to ever be used in any capacity Vatican You "pitch" for a new Breadbox Media jingle. Reflect on the ways that we're called to show mercy because God has shown His mercy toward us; and the obligation we create for ourselves to be merciful every time we pray the "Our Father"
In other news, our iTunes "explicit" rating has been rescinded, so that's good news! Check out this episode. Vol 2, Ep 2 "The Never Ending Story"
Jump right into the meat of what Pope Francis' has to say about God's mercy in this episode (after Fr. Alan fires off his laser to get that out of his system). Fr. Chris' 2-Minute Drill points out that if there's anything never-ending about the human story, it's God's mercy. Fr. Shaun's famous 'creative Latin' will give you a chuckle. We explore how God's infinite mercy is rooted in His divine nature, and how our need to show mercy is rooted in God's mercy toward us. And Fr. Jerry takes this week's Pop Quiz Hotshot question, "What is an indulgence?" Enjoy!